Baudruchage is the name for the sealing technique to prevent perfume from spillage and evaporation. 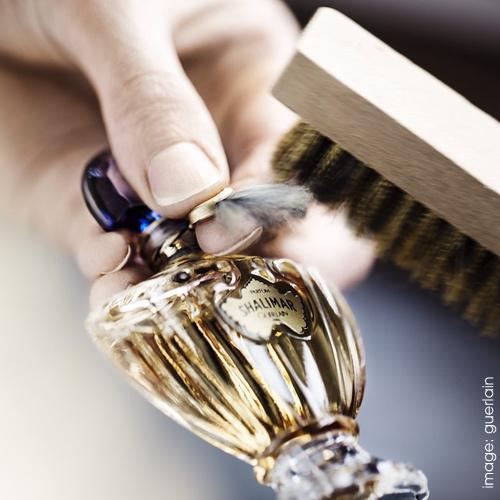 It is one of the earliest forms of perfume bottle sealing and was originally made from a thin membrane (baudruche) of animal gut and silk or cotton cords wrapped around the stopper and the mouth of the bottle. Later, onionskin or a thick plastic film was used in place of the animal derived membranes. After the baudruche is in place, a small metal seal is clamped onto the middle of the two ends of the cord to hold them in place. 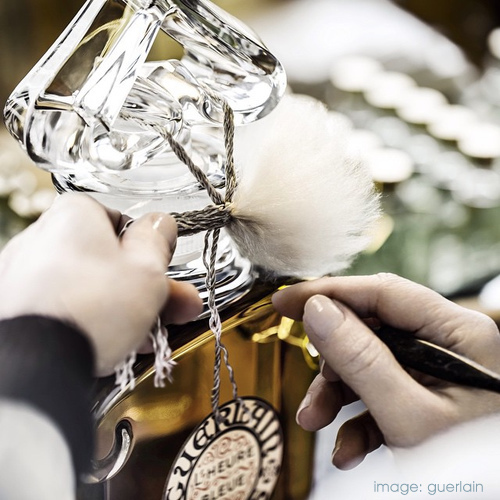 Guerlain uses two more finishing techniques in the sealing of their parfum (extrait) bottles, these involve further decoration of the baudruchage into something pretty and special. Barbichage is the term used for unraveling and brushing out the loose ends of the cords to form a fuzzy tassel. 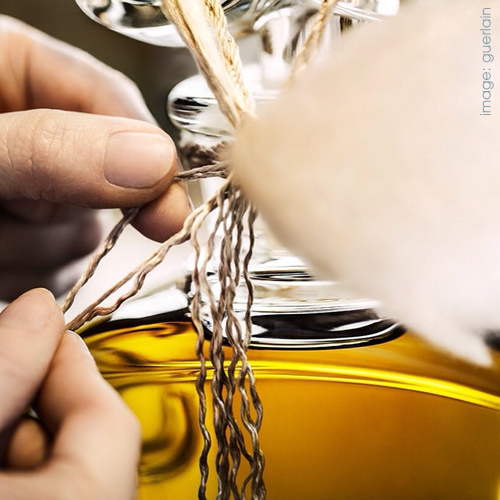 Then Brossage, the term for brushing the threads into a triangular shape takes place and the bottle is ready to be packed and sold. 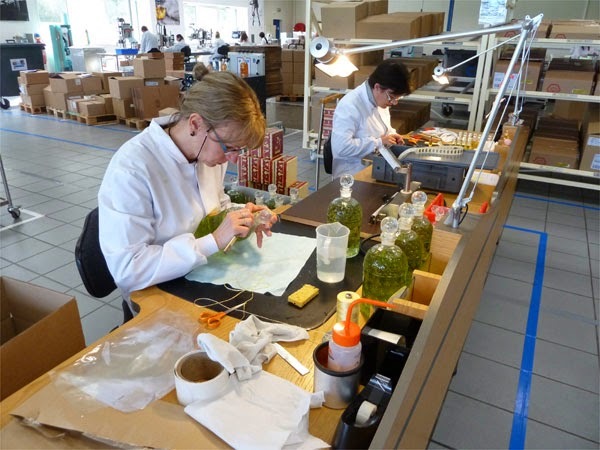 These special employees of Guerlain at their Orphin factory, who conduct these delicate procedures are known as Dames de Table, officially known as a baudrucheuse. There are only seven women who perform this task each day. These nimble fingered ladies are so adept at this sealing technique that they can seal 100 bottles a day. 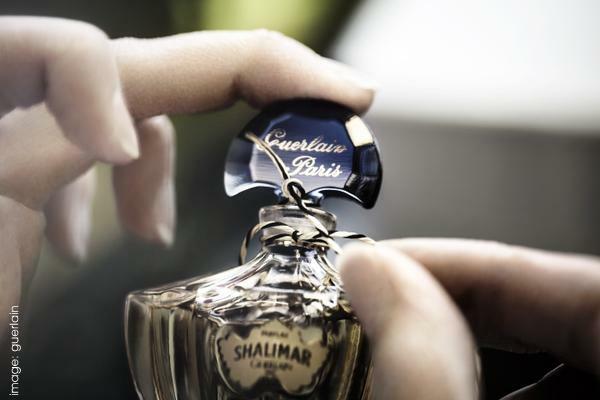 One of Guerlain's "Dames de Table" sealing a bottle of Le Petit Robe Noire parfum. 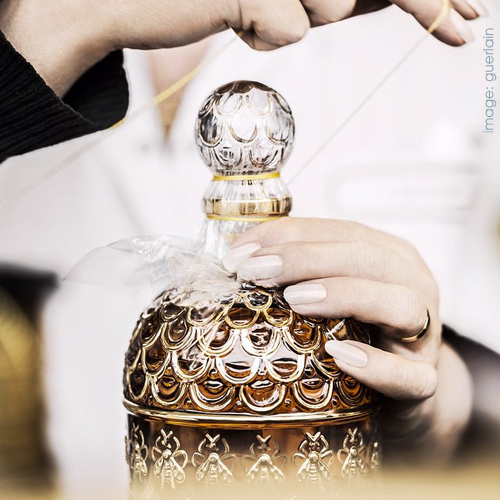 One of Guerlain's "Dames de Table" sealing bee bottles.